Back in 1895, Dr. Bresee began the work of the Church of the Nazarene. He had only a hundred or so faithful supporters to start with. During the 20 years that followed, he led that church to become a denomination of nearly 32,000 members. It extended over the North American continent and across to the British Isles. It had 800 local churches, a publishing house, several colleges, and scores of missionaries in foreign countries. Many years have passed since Dr. Bresee's death. Thousands have gone to meet him "inside the Eastern Gate". But still his influence lives on. The church he organized, and for which he gave his last bit of strength, continues. Today the Church of the Nazarene has grown to over a […] million members. In the deep winter of 1838, when the snow was piled high on the ground and a new year was only hours away, a son was born to a family in Northern New York state, and they called him Phineas, after his father. He grew up on the family farm with his older sister, and before he was four years old, he was sent to school. From early childhood on he heard from the Bible and went to church, and he was determined to become a minister when he grew up. During his teen years, the family moved to a bigger farm, and with all the extra work Phineas finally had to quit school. Yet, he continued studying at home. After he accepted Jesus Christ as Savior, he started witnessing and holding prayer meetings. He received a sort of beginner's preacher's license, yet he was very afraid to preach. In his first sermon he went all the way from creation to the Second Coming of Christ and afterwards wondered what else he could preach about. 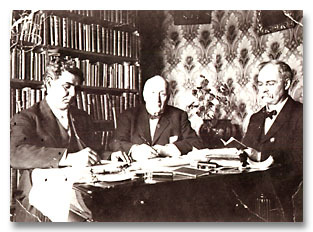 Phineas F. Bresee (center) with E. P. Ellyson (left) and H. F. Reynolds After moving to Iowa in 1856, the Methodist church gave him a district preacher's license and he continued in the Christian work. Quite soon, he was given his own church to pastor. He had a difficult time there, which was pleasantly interrupted by a trip back to New York in 1860, where Phineas married Maria Hibbard, the sister of a close friend of his. Shortly after the Civil War broke out, Mr. Bresee was ordained at the Methodist conference, which meant that he was now a full minister in the Methodist church. The years that followed were rather difficult for the Bresee family. Numerous different preaching assignments and other occupations were assigned to Mr. Bresee, and the family lived in poverty most of the time. In 1883, they decided to move to California. With their six children they made the eight-day trip in a train wagon, into which they had stuffed most of their belongings. In Pasadena, Los Angeles, Phineas became the minister of a Methodist church, which grew strongly under his leadership. At the same time he was heavily involved in addressing social issues, such as the liquor business, which brought him many threats, but also contributed to his preaching, as more and more people became Christians and members of his church. Yet, Dr. Bresee (by this time he had received an honorary degree from the University of Southern California) felt a calling for a new ministry - reaching out to the poor, the needy. He helped organize a nondenominational project, which they called "Peniel Mission". The leaders of the Methodist church did not like this project. They feared it might hurt the image of the church. So Dr. Bresee was forced to either give up the mission or leave the church. After a night of struggle, he decided to leave the church. A fruitful time at the mission followed. Yet, in the summer as Dr. Bresee preached at a camp meeting away to the North, he was informed that the mission no longer needed him. Not really knowing what to do or what the future would hold, he returned to California. His friends urged him to start a new church - a mission church where he could minister to the poor and preach holiness as much as he liked. Dr. Bresee prayed - and made his decision. On October 20, 1895 the first Church of the Nazarene was organized in Pasadena, CA. 135 charter members made a pledge to commit their lives to the work of Jesus the Nazarene. By the end of the first year, 350 people had joined the church. After five years the membership had increased to almost 1,000. New churches were started, and other groups joined the church. California was not the only state with holiness movements and holiness churches. In the Northeastern United States there was a group called "The Association of Pentecostal Churches of America", and in Texas another group called the "Holiness Church of Christ". These two were interested in merging with the Church of the Nazarene. On October 13, 1908, the merge was made complete in a tent meeting in Pilot Point, Texas. This day is known as the official birthday of the Church of the Nazarene. Since an almost fatal accident in 1900 Dr. Bresee had never quite recovered his health. Doing the work of three or four persons at once certainly was a considerable strain on him, too. In 1915 he completed his journey on earth and went home. Even though Dr. Phineas Bresee is not directly connected to Southern Nazarene University as a president or professor, still as the founder of the Church of the Nazarene he has also impacted this college. His complete faith is exemplary, daring to take uncertain steps and walk out into the unknown; and his mission to reach out to the poor and rejected and minister to them in God's love is a lifestyle worth imitating.